Though NASA sadly spent its recent 55th birthday furloughing employees thanks to the government shutdown, the discovery of water in Martian soil just a week earlier made for a pretty thrilling development at the agency. Ironically, there couldn’t be a better time for the release of This is Mars, which offers all the photographic evidence you need to feel the excitement behind NASA's literally other-worldly expeditions. 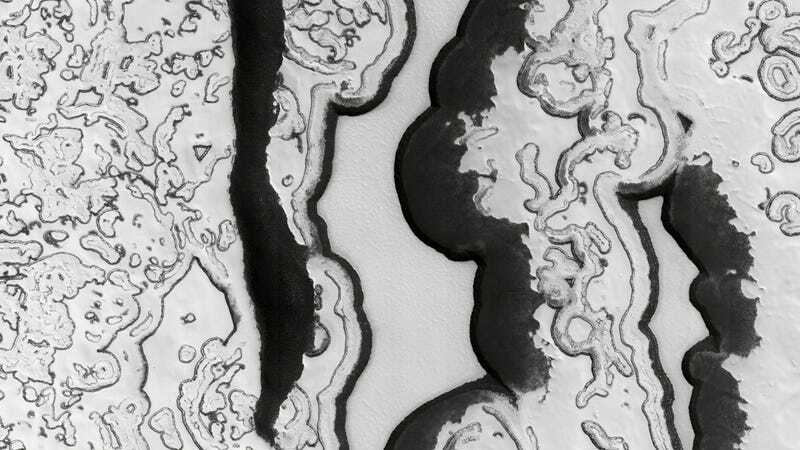 The massive new monograph from Aperture shows the Red Planet in surreal gradations of black, white, and shades of grey, featuring photos taken by the Mars Reconnaissance Orbiter (MRO), an observation satellite launched in 2005. The MRO has since beamed back thousands upon thousands of gigabytes of photos, meticulously edited for this book by French author and designer Xavier Barral. Part of what makes these images so fascinating is their scale, which somehow manages to look equal parts petri dish and Google Earth. They offer hi-def glimpses of geometric terrains, clay mineral craters, sedimentary strata, and labyrinthine canyons; but the book is more than just a visual journey. In addition to the striking shots, it includes an in-depth introduction to the planet’s origins and evolution by astrophysicist Frances Beard; a variety of geological maps; and an observational timeline dating back to antiquity—when Babylonians, Egyptians, and Greeks began to notice an “errant star”—carrying through to Curiosity’s incredible landing just last year. The dark patches seemingly growing across this geometric terrain are actually areas of springtime defrosting. The fine dust of these sand whirlwinds travel in both lines and spirals, leaving strange hieroglyphic marks on the surface of the planet. Clay minerals found at the edge of this crater indicate the Red Planet's humid past. Fractured strata are formed from extreme, seasonal thermal fluctuations, creating vast landscapes that look like grains of wood. Frost and "carbonic ice" covers black sand dunes made from eroded basalt. These arc-shaped sand-dunes form repetitive scalloped ridges when lit by the sun. Ancient lava flows from a volcanic plateau formed these meandering canyons. Lead image: Region of the Polar South: A complex landscape of carbon dioxide ice.